Travel in air-conditioned comfort around the fascinating city of Phoenix. See the old and new West as you visit the State Capitol, Camelback Mountain,the saloons and shops of the Old Town area and drive by the Wrigley Mansion. You will also have some free time to browse the local shops and galleries of Scottsdale at your own pace. Our Valley Area Highlights tour is an approximate 4-hour tour of the lively Phoenix/Scottsdale area. 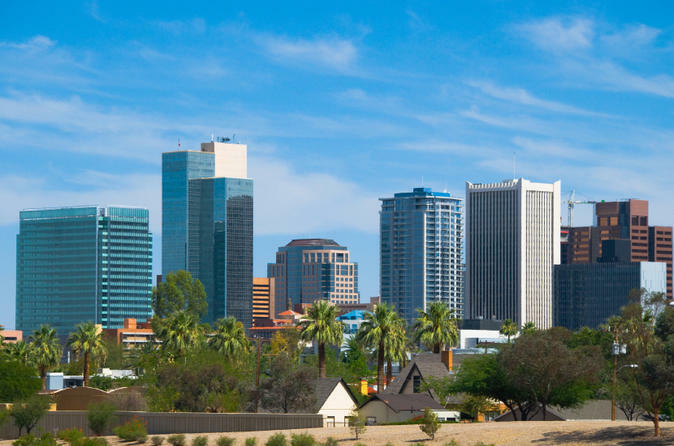 Visit the thriving Phoenix area, the 6th largest city in the U.S. You will enjoy views of the State Capitol, Chase Field-which is home of the Arizona Diamondbacks, Camelback Mountain-the tallest mountain in the Phoenix-metro area and popular for hikers, South Mountain Park, Tempe and Scottsdale 5th Avenue arts district. The tour includes an hour for shopping in Old Town Scottsdale. This is a great introduction to the Valley of the Sun. You will have an hour at leisure to browse the shops and galleries of Old Town Scottsdale.